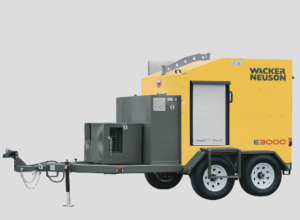 Looking to rent the highly capable and technically advanced Ground Heater Rental – E3000ES by Wacker Neuson in Rochester NY, Ithaca NY and Western NY? Capable for both thawing and curing. Powered by one pump per hose loop which result in a much greater amount of heat (Btu’s) per hour being delivered to the job site. Powerfully heats and / or cures up to 6,600 square feet. Ask the Duke Company’s winter fleet experts about adding ground heater rental accessories that will vastly expand the curing capability to up to 18,000 ware feet. Also capable of providing dry heat 535,000 cubic feet with accessories.